North Attleboro junior pitcher Matt Wanless tossed six scoreless innings for the Red Rocketeers Friday, giving up five hits and a walk while striking out three. (Cameron Merritt/HockomockSports.com). NORTH ATTLEBORO, Mass. – A five-run first inning gave the Davenport division-leading North Attleboro Red Rocketeers the boost they needed Friday as they cruised to an 11-4 win over the King Philip Warriors at Community Field. The top of the Red Rocketeer batting order did much of the team’s heavy hitting, as senior outfielder Nate Pearce went 3-for-3 with a double, three runs and an RBI. Senior catcher Zach DeMattio went 2-for-4 with three RBI, two runs and a double, while junior outfielder Brendan McHugh went 2-for-2 with two runs, a double and a pair of walks from the leadoff spot. 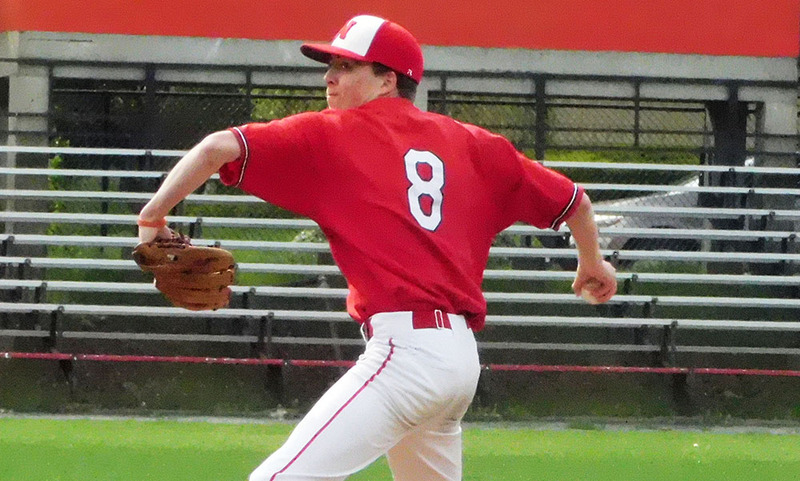 On the mound, North Attleboro had a solid outing from junior pitcher Matt Wanless, who struck out three while surrendering five hits and a walk through six scoreless innings in the win. King Philip struck for four runs in the top of the seventh inning. The Rocketeer offense launched right off the bat in the bottom of the first, as McHugh sent the first pitch he saw deep into right-center field for a double. The next pitch hit senior shortstop Nick Sinacola, and the pair would be driven in through a two-RBI double from DeMattio. 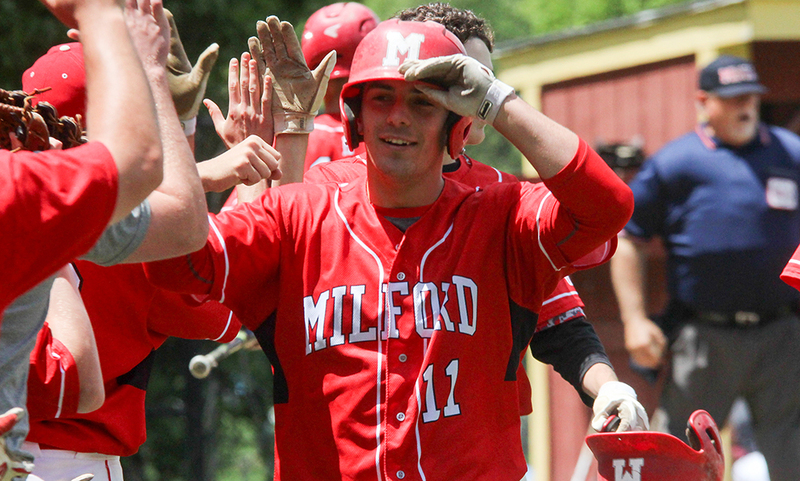 A double by Pearce the next at-bat sent DeMattio home and gave North Attleboro the early 3-0 lead. Junior third baseman Nick Raneri nearly had an inside-the-park home run, which drove in Pearce, though he would be thrown at the plate on the relay from KP junior second baseman Ian Zimmerman. Senior outfielder Jeff Gale reached base due to an error, and after batting through the order, the hosts emerged from the inning with a 5-0 advantage. In the bottom of the second, the Rocketeers nearly batted around again, coming up one player short as junior outfielder Ryan Warren flew out to center to end the inning. Before that, however, McHugh reached on a full-count count, only to be driven in again by DeMattio two batters later. Pearce walked during the next at-bat, and both were driven in by a two-RBI single from senior first baseman Aidan Harding, giving the hosts a commanding 8-0 lead. The game evened out for much of the middle innings, with the Warriors having their first solid scoring opportunity in the fourth soiled as DeMattio picked off a runner at third from behind the plate. The scoreline stayed the same until the bottom of the sixth when a leadoff single by Pearce was turned into the ninth run by Raneri an at-bat later. Junior pinch hitter Matt Seavey drove in Raneri for the tenth run on an RBI single, while pinch hitter Shawn Watters drove Seavey in on another RBI single to extend the lead to 11-0. In the top of the seventh, facing a new pitcher, the Warrior offense roared to life. After senior pinch hitter Jackson Siebler reached base on a fielder’s choice, he stole second and would come home through a bases-loaded walk to fellow senior pinch hitter Ben Furfari, as junior pinch hitters David Morganelli and Matt Dix would reach base through singles. Third baseman Chris Sawyer drove in Morganelli on an RBI single to double the Warrior lead, while a double from Jeremey Rhines drove in both Dix and Furfari to make it 11-4. The comeback effort, however, would be cut short for the Warriors, as the Rocketeers secured another win. Both teams return to action Monday, as North Attleboro (12-1 Hockomock, 13-1 overall) travels to Foxboro while King Philip (5-9 Hockomock, 5-10 overall) will face Franklin. WRENTHAM, Mass. – King Philip escaped a jam in the top half of the fourth and scored three runs in the bottom half to pick up a 4-1 non-league win over North Attleboro on Tuesday afternoon. Pitching dominated the game early on as both North’s Nick Sinacola and KP’s Stephen Murray pitched 1-2-3 first innings. Through three innings, the only hit of the game was a second inning single single by North Attleboro catcher Zach DeMattio, who paced North’s offense with a 2-4 day, including an RBI triple. After DeMattio’s single, Nick Crowley got hit by a pitch which set North up with first and second and nobody out, but Murray got a pop out to third and then a fly out to Patrick Limerick in left field, then doubled off DeMattio at second after he left early. Nick Sinacola set down the first nine KP batters he faced, striking out three. In the fourth, both teams got their offense working, as North loaded the bases after back to back singles from Nick Crawley and Matt Iaconis and a two out walk by John Brennan, but Murray got out of the bases loaded jam by getting a hit back to the mound for a 1-3 put out. “That’s what Steve does. He’s been with me for three years now, and when he gets in a jam I don’t get nervous, I get worked up, but not nervous because Steve’s gotten out of situations like that so many times now,” said KP coach Pat Weir about Murray’s ability to get out of jams. In the bottom half of the inning, the Warriors took advantage of that momentum. Kyle Guenther became KP’s first base runner with a single into center, and Will Weir connected on a one-out single, which set up first and second with only one out. Sinacola got his fourth strikeout of the game for the second out but walked Ben Furfari to load the bases. Collin Cooke then drew a walk to score Guenther, and Sinacola just barely hit Jack Webster with a pitch which allowed Weir to cross the plate. Chris Wing drew KP’s second bases loaded walk of the inning, which brought home Furfari and gave KP a 3-0 advantage. After Wing’s walk, Peter Cohen came in to relieve Sinacola, and he induced a grounder to Brennan, who stepped on second for the force out to end the inning. In the top of the fifth, North answered back with a two out rally of their own. Nate Pearce hit a two-out double into the gap and DeMattio crushed a ball deep into right for a triple to bring home Pearce and get North on the board and cut the KP lead to 3-1. In the bottom half of the 5th, Guenthner drew a walk and advanced to second on a sacrifice bunt by Limerick. Will Weir singled home Guenther, and advanced to second on an error on the throw home. Murray was then hit by a pitch, and with Furfari at the plate, Murray and Weir executed a perfect double to steal to set up second and third with only one out. However Furfari’s ensuing flyout was not deep enough to score Weir, and a ground out to short to end the inning. After walking Iaconis to start the top of the sixth, Murray was pulled from the game, but he still had a very impressive outing, striking out three in five inning of work while only allowing one run. Jackson Shiebler replaced Murray, and induced a pair of fielder’s choice outs and then got a force out to end the inning. Cohen set down the Warriors in order in the bottom of the sixth. In the seventh, Shiebler got a fly out to center and a ground out, but after walking Nate Pearce, North had one last chance. After a tough at-bat with DeMattio fouling off a couple of pitches, Shiebler ended the game with a strikeout. KP (5-1) will get back at it on Thursday at noon when they take on Taunton (4-0) at home. North Attleboro (3-3 for tournament purposes) will return home to Community Field on Thursday where they’ll do battle with Stoughton (4-2).